Trabon MD Divider Valves from MotionSource are the most compact series progressive solution making it a perfect fit for tight spaced applications. 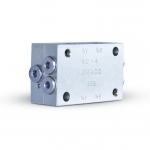 Quality, durability and flexibility is what you get with Trabon MD divider valves. New systems or retro-fit on existing systems, the MotionSource 24/7 Service Team is Graco trained and available to help you. 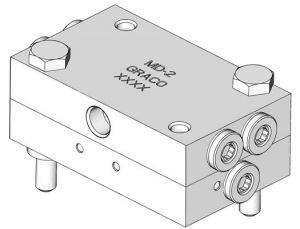 Trabon MD divider valves are available with 2, 3, 4, or 6 outlets. Add the option of a Graco cycle indicator pin to provide positive assurance of a successful lube event. A perfect fit for tight manufacturing machines or in the printing industry, these divider valves deliver when you need it. sure of what you need? Our years of engineering innovative automated lubrication systems, plus regularly being named a Graco Platinum and Gold Partner means that the components you need are in stock right now.